In Ashfield Car Park, in Settle town centre. Our prices are very competitive – why travel miles when you can save money by buying locally? 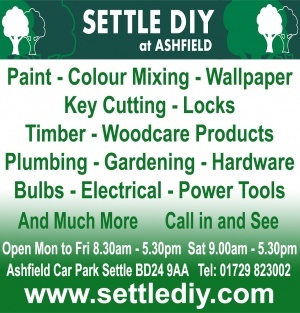 We are a traditional DIY store, supplying quality DIY products and housewares to the general public and trade customers. Our cheerful, knowledgeable and well-trained staff will always be happy to give advice on your DIY project. We offer a professional paint-mixing service, using two paint-mixing machines to provide the widest possible choice of colours from a variety of well-known ranges, including Crown, Berger, Leyland & Johnstone Trade, Dulux and many more. We also stock the full range of decorating accessories, lining paper. Wallpaper to order. A wide range of stains, varnishes, oils and preservers. Brands in stock include Cuprinol, Ronseal, Rustins and Barrattine. To fit in your car, so our soft wood is supplied in 1.8m and 2.4m lengths. We stock sheet material, ply and MDF in sizes from 2’ x 2’ all the way up to 4’ x 3’ and 6’ x 2’. We have a wide range of light bulbs (still stocking 40, 60, 100, and 150 watt bulbs!) including candle bulbs, golf ball bulbs, all sizes of fluorescent tubes, and energy-saving bulbs. Cable and fittings for your electrical project. We stock Yorkshire, compression and Speedfit fittings, taps, gate valves, isolators, flexi-connectors, stop-ends, copper and plastic pipe, Traps and waste pipe fittings. Draper power tools for workshop and garden also a wide range hand tools. We also provide a key-cutting service while you wait, using locksmith-quality cutting machines, and locks by Union, ERA and Yale. We also keep a good range of door handles, padlocks and chains. Our extensive range of cleaning products includes the HG range. We stock all the adhesives and sealants you are likely to need. The list is endless.